If you’re like a lot of dog lovers, you recognize the importance of a healthy mouth for your dog, but you might be a little confused. How often should you brush your dog’s teeth yourself vs. taking Fido to the veterinarian for professional teeth cleaning? Are there long-term health implications if you DON’T get your pup’s teeth cleaned regularly? 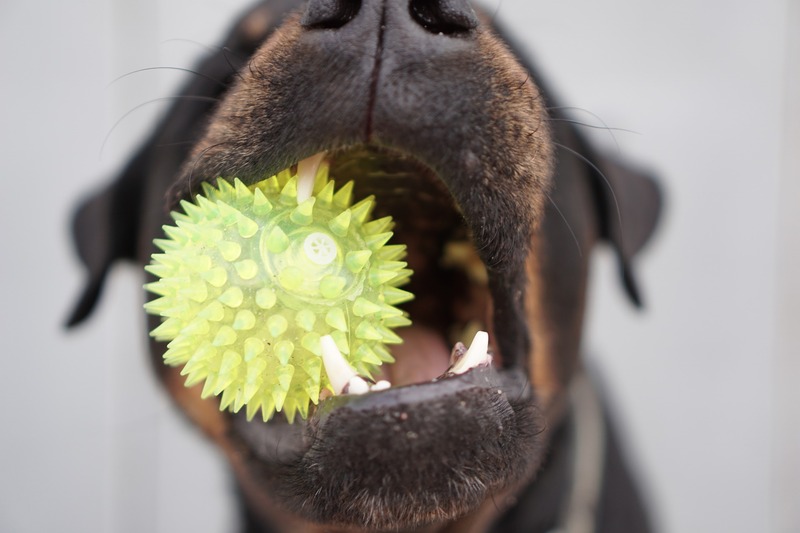 Are there signs of dental problems you can look for in your dog's mouth? Great questions, all! First, you should know that regular cleaning of your dog’s teeth is extremely important. Periodontal disease is a leading problem for dogs. This causes gums to bleed and plaque to build up. If left untreated, it can lead to painful gingivitis (gum inflammation) and tooth loss. In other words, your dog is susceptible to all the things that people are when it comes to dental care. Yet, many dog lovers don't care for their dog's teeth regularly because they don't realize the importance. Here's a quick way you can check. Take a look at your dog’s mouth. Does he have ugly brown stains on his teeth? That’s tarter build up. How’s the doggie breath? Less than fresh? These are two signs that he could use a dental cleaning. Despite what you may have heard, stinky doggie breath is not part and parcel of the canine species. It can be an indication of a mouth filled with bacteria due to infected gums, and that’s a recipe for pain, tooth loss, and other health problems. What's a dog lover to do? Your veterinarian can help you create a personalized dental plan for your dog. It will combine both home dental care and professional level cleaning so your dog can have the best care. In the ideal world, you would brush your dog’s teeth daily. Yes, we realize your dog may not want to cooperate but hopefully, with a bit of patience and practice, you can incorporate this into your routine. As you may know, there are a variety of doggie toothbrushes and toothpastes on the market. Doggie toothpaste not only has enticing flavors like beef and chicken, but it also is made with ingestible ingredients that won't hurt your pup's stomach when he swallows it. We recommend starting slowly by rubbing your finger across your dog’s teeth with or without doggie toothpaste. You want to get him used to having your fingers in his mouth. Once he's used to your fingers, you'll introduce the toothbrush. This may take a few sessions and that's OK. It's still a win! On the other hand, if your dog is absolutely, no way, not having it, then you can talk to your veterinarian about alternatives. The Veterinary Oral Health Council have created several PDF's with recommendations for chews and dry diets. There are also mouth rinses especially made for dogs. While these can help supplement the day to day care, they don't remove the need for professional cleaning. How Often Does My Dog Need Professional Cleaning? Your veterinarian will discuss a customized schedule with you, but the general rule is that your dog needs an annual cleaning. When you bring your dog in for his annual wellness exam, we’ll examine his teeth and look for any potential problems, such as lesions in the mouth, sore gums, or stinky breath. If you notice that your dog is showing any symptoms of potential dental problems, please schedule a visit with your veterinarian. If you notice your dog's appetite changing, especially if your dog doesn't want to eat, that's a clue that something could be wrong. Other obvious signs include things like bleeding gums, broken teeth, or tartar build up. You don't want to wait because if left untreated, dental problems can lead to periodontal disease which leads to painful gums and lost teeth for your dog. The secret to great dog dental care is to start when they're young and maintain a regular schedule of teeth cleanings. That way, you can reduce the risk of tooth decay and the accompanying pain. If you'd like one of our veterinarians to assess your dog's dental health, please contact us to book your appointment.